I know that there's a court case over whether a monkey that took a selfie can own the copyright in the photo (or whether there even is a copyright on it.) I just read that computers are learning how to write music, paint pictures, and do lots of things that we humans think are creative. Can computers be authors and own copyrights in the works that they create? If a computer arranges music (the song "Daisy", for example) can it earn royalties? You're correct that computers are now making art. Using a branch of artificial intelligence called "machine learning" computers are now analyzing thousands of songs, and then composing new ones based on common features that they detect in the music that they've "heard". One of LW&H's clients even applied for patent after he built one of these systems that was capable of understanding musical moods, motifs, and themes without having to label them with words. That system, and other like it, are able to write new music that is similar to existing music, but does not copy at all - it "understands" what makes one song similar to another. Software like that may even be able some day to prove that one song is, or is not a copy of another, simplifying copyright law suits which now require the expert testimony of musicologists to guide juries in the features to which they should listen in making their similarity determinations. But, back to computers as authors... A group of museums and computer companies have unveiled "The Next Rembrandt". If you've ever seen a real painting by Rembrandt van Rijn, you will instantly recognize this new "painting" (actually a 3D printed sculpture) as his style. It's as if, more than 300 years after his death, he has been brought back to life to paint one more portrait. But who "owns" this work of art? While there are few clear answers to any of the questions above, one thing may be said: current United States copyright law seems to confer the status of "author" only on real people and on corporations that derive their rights from real people. 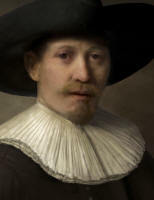 Thus, it may be that a corporation may own (or license) the rights to the data about Rembrandt's paintings, and other corporations may employ the programmers who designed the software that "learned" from that data and produced the new artwork, and thus, it is possible that one or more corporations owns a copyright in the new artwork. In principle, the Next Rembrandt is pretty simple-simpler, in any event, than the monkey photographer. There is unquestionably a person involved: the programmer or a group of programmers. The programmers create a computer program which produces a product - the Rembrandt pastiche. So far as it goes, this is just a more complicated version of an artist who builds a paint cannon that fires a random series of paint pellets at a canvas. No one, I think, would seriously deny that the artist in this case is the "author" of the resulting painting, or that the painting lacks originality in this sense (being original to the artist) because of the method by which it is created. The computer program, like the paint cannon, is a tool (albeit a much more complicated one) for producing the end product. The programmers are responsible for the form of the resulting product in the same way that our artist is responsible for the paint-cannon painting, and so are the authors responsible for the product's originality, to the extent that it has any. For more on how this automated enigma may be decoded, see Acosta, Raquel, "Artificial Intelligence and Authorship Rights". Are you artificially intelligent (or does your spouse claim that you are?) Have you authored anything? Quick, call the attorneys at LW&H. They'd love to meet you and help you to decode the legal situation. SCOTUS Scores One For Free Speech and Redskins Team Rejoices! The Washington Redskins NFL team has been fighting for years to maintain its registered trademarks containing the term REDSKINS. Its on and off again fight has been hotly debated in public, press and the courts. Finally, the United States Supreme Court has weighed in. Funny enough, the case before them was not that of the Redskins but that of an obscure West Coast band, the Slants. Its front-man, Simon Tao, filed a trademark application for SLANTS, which was rejected by the United States Patent and Trademark Office (PTO) because it was derogatory to persons of Asian descent. We won't keep you in suspense. The Supreme Court rejected the PTO position and held that the anti-disparagement clause of the Lanham Act, section 2(a), was an unconstitutional abridgment of freedom of speech. Simon Tao won! So how did we get here? Our readers may recall that approximately three years ago the Trademark Trial and Appeal Board ("TTAB") cancelled the Redskins trademark because it was disparaging to Native Americans. The question we posed in a short article was whether the Redskins could continue using its trademark despite cancellation of its trademark registration. Since then a lot has happened. The Redskins filed an appeal to the United States District Court In Alexandria, Virginia. In July 2015, the district court affirmed the TTAB. The Redskins then filed an appeal to the United States Court Of Appeals For the Fourth Circuit. That court stayed the action because Simon Tam's lawsuit, Lee v. Tam, was pending before the U.S. Supreme Court. Back to the Supreme Court's opinion in Tam. Justice Alito, delivering the Opinion of the Court, wrote unambiguously that section 2(a) of the Lanham Act violates the free speech clause of the First Amendment: "It offends a bedrock First Amendment principle: Speech may not be banned on the grounds that it expresses ideas that offend." it is far-fetched to suggest that the content of the registered mark is government speech. If the federal registration for trademark makes the mark government speech, the Federal Government is babbling prodigiously and incoherently. It is saying many unseemly things.... It is expressing contradictory views. It is unashamedly endorsing a vast array of commercial products and services. And it is providing Delphic advice to the consuming public. Likewise the Court rejected the government's argument that trademark registration is a form of "subsidized" speech. That argument basically says that the government is not required to subsidize speech that it does not wish to promote. Acknowledging that this area of the law is tricky, Justice Alito concluded that there was no legal basis or precedent for concluding that trademark registration was a form of subsidized speech. The [disparagement] clause reaches any trademark that disparages any person, group, or institution. It applies to trademarks like the following: "Down with racists," "Down with sexists," "Down with homophobes." It is not an anti-discrimination clause; it is a happy talk clause. In this way, it goes much further than is necessary to serve the interests asserted [emphasis in original]. Undoubtedly, the Redskins now have a firm basis in which to reinstate their registered trademarks. What does this mean for trademarks that are not disparaging but "scandalous" under section 2 (a), the so-called "scandalous provision"? In a recent "Alert" the PTO acknowledged that under Tam, disparagement is no longer a valid ground for refusal or cancellation of a trademark registration but the scandalous provision - a different kettle of fish - while not subject to the Supreme Court's decision, is presently pending before the Federal Circuit court in another case, In re Brunetti. Let's see what happens. The Eastern District of Texas is a large rural Federal judicial district. The biggest city is about the size of Allentown, Pennsylvania. Not what you would expect of a hotbed of patent litigation. Nonetheless, the Eastern District of Texas has dominated patent infringement litigation for years. In the first quarter of 2017, patent plaintiffs filed a total of 938 cases nationwide with 33% of those cases in the Eastern District of Texas. Of the Eastern District patent cases, most are pending before a single person, Judge Rodney Gilstrap, sitting in Marshall, Texas (population 24,000). Why so many patent infringement cases in rural Texas? Why so many before Judge Gilstrap? In short, what Switzerland was for banking, the Eastern District of Texas became for patent plaintiffs. Switzerland developed banking rules that favored persons who made decisions on where to deposit large amounts of money. The Eastern District of Texas developed rules that favored persons who made the decision of where to file patent infringement lawsuits. The Eastern District developed procedures that moved patent cases quickly to trial, that were generally friendly to patent plaintiffs and that were relatively expensive for patent defendants. For a history on the rise of Marshall, Texas as a center for patent litigation, see Kaleigh Rogers' article. Last month we told you how the Supreme Court's new TC Heartland decision effectively pulled venue for most patent cases from the Eastern District of Texas. In TC Heartland, the Supreme Court limited the venue over patent cases against corporations to the state of incorporation or "...where the defendant has committed acts of infringement and has a regular and established place of business." On June 2, after the TC Heartland decision, Uniloc Corp. sued Apple and Google in the Eastern District for patent infringement. Uniloc's argument for venue over Apple is based on the presence of two Apple retail stores in the Eastern District. The argument for venue over Google is based on use in the Eastern District of Google services by consumers, by Internet sales, and by Google Street View. We do not yet know whether these factors will be enough for the Eastern District to hear the cases, but Congress is watching and considering wether to limit the venue of patent infringement lawsuits even more.